Okay, so here is where the development notes should go. Bad news. There are none. I spit out one idea as a starting point and u/AlfredPudding and I mixed it. The end result was "perfection" as he described it. There's nothing to add, there's nothing to take out. It's a perfect balance of cream, vanilla, butter, and egginess. Imagine eating a spoonful of vanilla ice cream, you swallow it but you still have that delightful leftover flavor of ice cream in your mouth. This is that, it tastes exactly like you just ate a spoonful of ice cream. LB VIC- Brings the creamy, lighlty eggy, butter notes. TFA Vanilla Swirl - Brings the vanilla soft serve-esque rich vanilla cream. HS FVIC - Brings the texture to wrap it up. A little bit of malty vanilla on the tail end. This recipe is the property of eyemakepizza and released under the CC Attribution-NonCommercial-Sharealike 4.0 license. You may not copy, derive or commercialize this recipe without following the terms of this license or the explicit permission of the creator. I haven't stopped vaping variants of this since I tried it originally. This is hands down the best ice cream vape I've ever had, and easily in my top 10 favorite recipes. I remember someone describing the mouth feel perfectly, it's almost a haunting sensation. After you finish exhaling, you're left with the most realistic sensation of actual cream in your mouth. The fact that it's so incredibly good right after mixing just adds bonus points on something that was already a 10/10 recipe. I've tried it by itself, with countless fruits, and next on the agenda is seeing how it handles chocolate. Do yourself a favor and mix this up immediately. Very nice, tested a drop of FLV apple pie filling in my tank - Instant apple pie and ice cream!! I’m looking at all my flavors in anticipation, who’s going to nail the next strawberry ice cream using this? I better stock up on these three flavors! 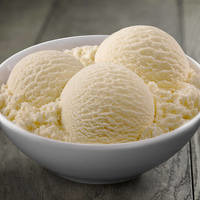 Perfect vanilla ice cream. Add your prefered slight touch of sweetener and go if you just want to vape vanilla ice cream. Or use it as an ingredient. It's practically dangerous for such a terrific vanilla ice cream base to be shake and vapeable like this. How am I supposed to not mix everything with a vanilla ice cream base now?